^ 『つくる陶磁器』編集部 編 1997, p. 24,44. ^ "Novel Approach To Injection Moulding." M.Y.Anwar, P.F. Messer, H.A. Davies, B. Ellis. Ceramic Technology International 1996. Sterling Publications Ltd., London, 1995. pg.95-96,98. ^ "Injection Moulding Of Cups With Handles." U.Haupt. 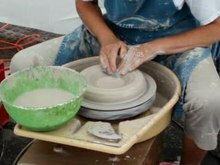 International Ceramics. No.2, 1998, pg. 48-51. ^ "Injection Moulding Technology In Tableware Production." Ceramic World Review. 13, No.54, 2003. pg94, 96-97. ^ ‘Sanitaryware Technology’. Domenico Fortuna. Gruppo Editoriale Faenza Editrice S.p.A. 2000. 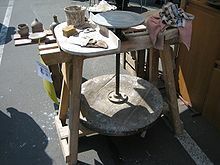 ^ Dictionary Of Ceramics. Arthur Dodd & David Murfin. 3rd edition. The Institute Of Minerals. 1994. ^ 『つくる陶磁器』編集部 編 1997, pp. 16-17. ^ 『つくる陶磁器』編集部 編 1997, p. 81. ^ "Clay Sewer Pipe Manufacture. Part II - The Effect Of Variable Alumina, Silica And Iron Oxide In Clays On Some Properties Of Salt Glazes." H.G.Schurecht. The Journal of the American Ceramic Society. Volume 6. Issue 6, Pg. 717 – 729. ^ "Dictionary Of Ceramics." Arthur Dodd & David Murfin. 3rd edition. The Institute Of Minerals. 1994. ^ "Ash Glaze Research." C. Metcalfe. Ceramic Review No.202. 2003. pg.48-50. ^ “Glaze From Wood Ashes And Their Colour Characteristics.” Y-S. Han, B-H. Lee. Korean Ceramic Society 41. No.2. 2004. Childe, V. G., (1951). Man Makes Himself. London: Watts & Co.
Rice, Prudence M. (1987). Pottery Analysis – A Sourcebook. Chicago: University of Chicago Press. ISBN 0-226-71118-8. Tschegg, C., Hein, I., Ntaflos, Th., 2008. State of the art multi-analytical geoscientific approach to identify Cypriot Bichrome Wheelmade Ware reproduction in the Eastern Nile delta (Egypt). Journal of Archaeological Science 35, 1134-1147.